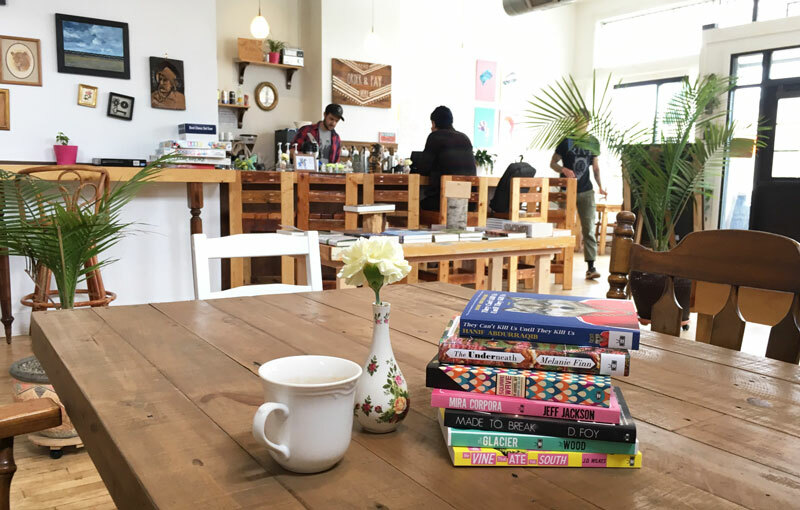 Two Dollar Radio Headquarters (HQ), a locally owned and operated family-run shop, is an indie bookstore, event space, bar, coffeehouse, and fully vegan cafe located on the scenic South Side of Columbus, Ohio. Our bookshop carries a carefully curated list of titles almost exclusively devoted to independently published literature. Our bar serves cocktails, wine, and draft beer (with Hoof Hearted Brewing on tap). And our cafe serves locally roasted coffee (from One Line and Hoof Hearted) and house-made from-scratch sandwiches, salads, pizzas, dips, and more. Our event space features a wide range of offerings from panel discussions, local and touring author readings, musicians, magicians, trivia, themed storytelling, poetry open mics, and more! ^ Owners Brett Gregory, Eliza Wood-Obenauf, and Eric Obenauf in the newly leased HQ space on Parsons Ave, June 2017. 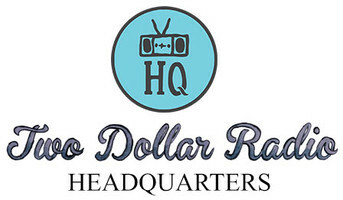 Two Dollar Radio Headquarters is the brick and mortar of indie publisher Two Dollar Radio. Two Dollar Radio was founded in 2005 by Eric Obenauf and Eliza Wood-Obenauf, a husband-and-wife team with a love of books. The original impetus to start our own indie book publishing company, fresh out of college, came on the heels of reading Andre Schiffrin's The Business of Books: How the International Conglomerates Took Over Publishing and Changed the Way We Read. Since then, we've published 5-6 books each year, some of which have been turned into films, honored by the National Book Foundation, finalists for the Los Angeles Times Book Prize, picked as "Editors' Choice" selections by The New York Times Book Review, and made year-end best-of lists at O, The Oprah Magazine, NPR, The Washington Post, Slate, Salon, The Believer, Chicago Tribune, Rolling Stone, San Francisco Chronicle, and others. In 2013 we added a film production arm, Moving Pictures, and have so far produced two micro-budget feature films. In 2017 we founded The Flyover Fest, an inclusive, fresh annual 3-day festival in the North Campus and South Clintonville neighborhoods of Columbus, Ohio, engaging the city, stimulating creativity, and sparking conversation. 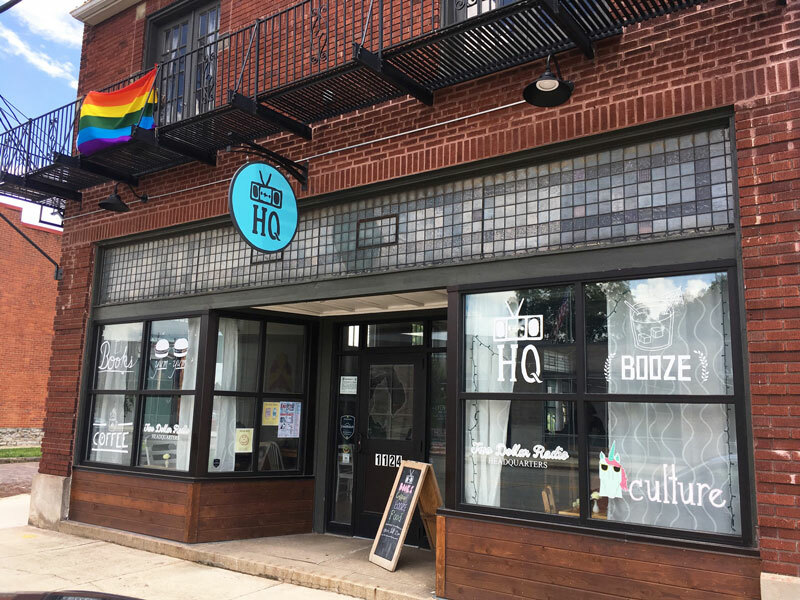 And then, also in 2017, after operating Two Dollar Radio out of our living room for 12 years, and with lots of help and planning, we expanded into a retail space on the South Side of Columbus, Ohio, and named it Two Dollar Radio Headquarters! Our motivation to open a brick and mortar came from a desire to interact with our broader community of book lovers here in the Midwest, to be able to provide a cozy meeting and event space, and to encourage the reading not only of our books, but of exciting, stellar work being published by other independent presses from around the country and abroad. Our passion extends to food and drink, which led us to develop a zesty, zingy, highly curated, fully vegan cafe, coffee, and bar menu. Read more about our cafe and view menus here. For our bathrooms and kitchen, we use the foaming hand soap from family-run, Grandview Heights neighborhood-based Glenn Avenue Soap Company, handcrafted from 100% organic oils with pure essential plant oils and extracts. Our freshly made tortillas come from Koki's Tortillas in the Hilltop neighborhood. Our delicious breads come from Lucky Cat Bakery out in Granville, Ohio. Our mouth-watering vegan desserts are made with love by Doughsis, also based in Granville, Ohio. We currently compost all of our food scraps and coffee grounds ourselves, in our Southern Orchards back yard. ^ Owner Eric Obenauf building the bar stools from reclaimed wood found in Clintonville, July 2017. ^ Owners Eric Obenauf and Brett Gregory with the brand new espresso machine, August 2017. ^ Owner Eliza Wood-Obenauf painting Eric Obenauf's original unicorn mural art, September 2017.